For close to a century, the techniques of collage and literary cut-up have been used to discover new forms in the visual arts, poetry, and music by undoing and restructuring text, image, and sound. “Cut-Up: Contemporary Collage and Cut-Up Histories through a Feminist Lens,” curated by artist Katie Vida, explores a multi-generational lineage of women artists who have pushed the boundary of cut-up techniques across media, including sculpture, video, sound art, painting, performance, printed matter, poetry, and photography. 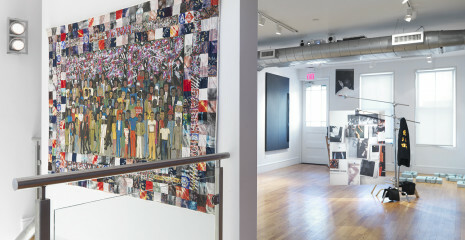 The exhibition is on view at Franklin Street Works from January 16 – April 3, 2016. The public opening reception is Saturday, January 16 from 6:00 – 8:00 pm with a member VIP opening from 5:00 – 6:00 pm. “Cut-Up” is sponsored, in part, by the Connecticut Office of the Arts. Featuring works from 1967 to the present, “Cut-Up” explores how collage and cut-up have informed the visual arts, literature, and experimental sound art. The exhibition also pays special attention to how the process of cutting apart and reordering language parallels an activist impulse to disrupt the status quo and develop new, alternative narratives. This skepticism and eschewing of “traditional” media is a strategy that was embraced by feminist artists in the late 1960s. At that time these artists embraced newer forms such as performance, film, text based works, and ephemeral sculpture, in part, to bypass patriarchal histories associated with established media such as monumental sculpture and painting. Ruth Anderson, Phyllis Baldino, Dodie Bellamy, Ofri Cnaani, Lourdes Correa-Carlo, Mayme Donsker, Heike-Karin Foell, Susan Howe, Jennie C. Jones, Alexis Knowlton, Carrie Moyer, Lorraine O’Grady, People Like Us, Sheila Pepe, Faith Ringgold, Mariah Robertson, Carolee Schneemann, Nancy Shaver, Meredyth Sparks, Cauleen Smith, Martine Syms, and Janice Tanaka.